CULLMAN, Ala. – Five people were arrested in Vinemont Wednesday after a traffic stop resulted in the discovery of approximately 24 grams of methamphetamine, 28 grams of marijuana, prescription pills, suboxone strips, syringes and other drug paraphernalia, according to the Cullman County Sheriff’s Office (CCSO). CCSO deputies made the traffic stop on U.S. Highway 31 North and found the drugs and other items after conducting a search of the vehicle. Charged with possession with intent to distribute methamphetamine, unlawful possession of a controlled substance, illegal possession of prescription drugs, second-degree unlawful possession of marijuana and possession of drug paraphernalia were: Christopher Lee Carter, 51, of Decatur; Dustin Michael Edward Jenkins, 29, of Hartselle; Frank Scott Lang, 47, of Hartselle; Kara Beth Griffin, 23, of Trinity; and Kimberly Roshell Lambert, 29, of Hartselle. 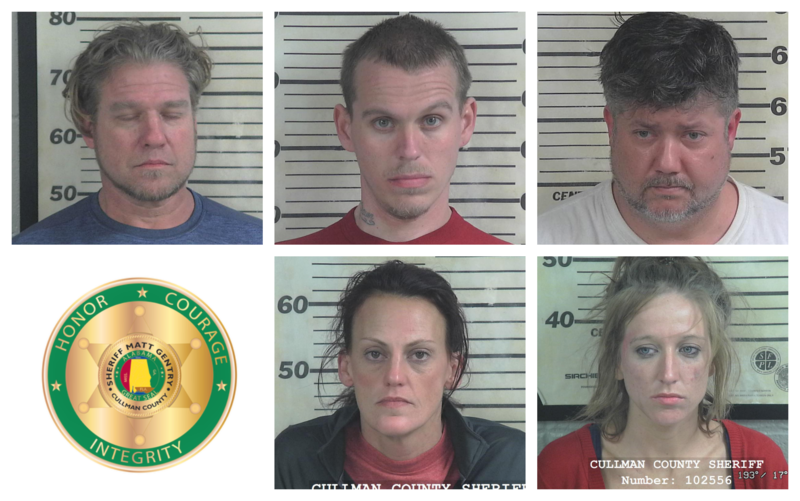 All suspects are currently in the Cullman County Detention Center, each on a $27,800 bond.